For nearly 70 years the Stiffel Company was known for making high quality beautiful lighting products of outstanding design. Stiffel closed and ceased all manufacturing in 2000. The Stiffel lamps that we offer on our website were made in the USA by Stiffel craftsmen. Don't miss this chance to own an American heirloom. 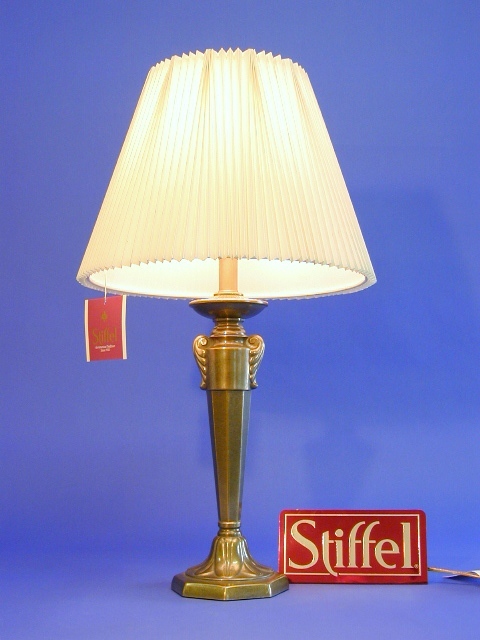 We purchased an inventory of approximately 300 Stiffel lamps from the Stiffel factory when they closed their operations here in the Chicago area. They came from dealer showrooms and are in excellent condition. We also have some unique lamps that came from their design department. Due to the variety of styles we have not finished cataloging and photographing all the lamps. We will post more lamps as time allows. In the meantime, if you would like a particular lamp, and you know the Stiffel number, or you have a picture of it, let us know and we will check to see if we have it. We also have some Stiffel parts, and glass shades. Please sign up for our RSS feed, if you'd like to be notified when we post more lamps. Quantities are very limited! Please order as soon as you can. Table lamps provide the ambient lighting needed for everyday work and leisure. They are best as the principal source of light for a living room, family room, den or bedroom. At Stiffel, we think of a table lamp as functional sculpture. Table lamps are often overlooked as design elements, yet they're important contributors to the feel of a room. Lamps create warmth and intimacy in a home, even in large rooms, or high-ceiling environments. No other light source provides the softness and comfort needed for reading, studying, sewing and general room illumination. They add a human dimension. Accent table lamps are designed to complement ambient or task lighting and provide a soft glow. They are suitable for desks, night stands, sofa-back tables, console table and buffets.